'Banbury is a large and populous Town in the northern part of the County of Oxford, situated upon the declivity of a hill, and upon the western side of the river Cherwell, which here divides the counties of Oxford and Northampton. 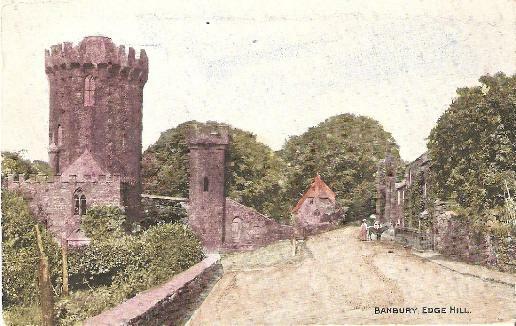 'Different authors have named different persons as the founders of Banbury. One asserts that Webba the son of Crida King of the Mercians built and fortified it during his peacable reign about the Year 589. Many writers cite a certain 'Banna', a supposed Anglo-Saxon chieftain as the founder, although this character seems to be unknown from any historical source. The name may have more to do with the Celtic ban - peak or ridge as Banbury is located at an easy access point through the Jurassic limestone ridge asociated with the Jurassic Way, a long-distance footpath between Banbury and Stamford in Lincolnshire. Certainly, there are indications that there was pre-Saxon habitation in the area: an iron age settlement was found in 2002. According to the Victoria County History: "Traces of prehistoric and Roman settlement have been found within the bounds of the parish, notably the remains of a substantial Roman building at Wickham Park, and a sub-Roman occupation site close to the Broughton road." The same source states that Crouch Hill has a Celtic name. The Tatler for September 5, 1710, gives a jocular account of an Ecclesiastical Thermometer, which had been invented for testing the degrees of zeal of particular places in behalf of the church. 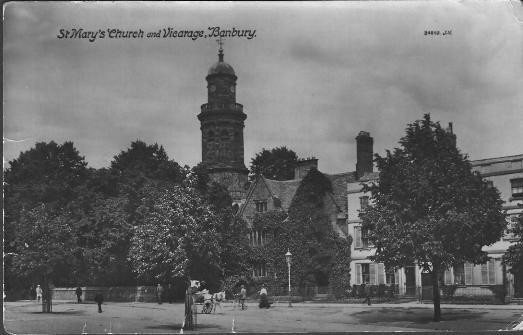 The writer states that the town of Banbury, Oxfordshire, which had been singled out by Dr Fuller a century before for its caket and zeal, proved itself by 'the glass,' i e., the above-mentioned thermometer, to be still characterised in a marked manner by the latter peculiarity. 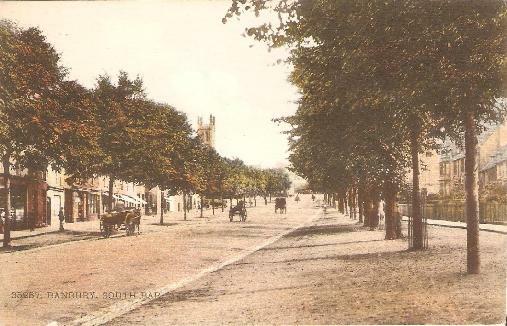 It may be suspected that Banbury at that time equally maintained its ancient distinction in respect of cakes, for the town is still noted for this article, insomuch that they are exported to the most distant parts of the world, one oaker alone in 1839 disposing of 139,500 twopenny ones. However this may be, we find that, in the days of Fuller, the material things which the town was remarkable for were: veal, cheese, and cakes; while it is not less certain, that in the abstract article zeal, Banbury was also notable. Thereby hangs a jest. When Philemon Holland was printing his English edition of Camden's Britannia, he added to the author's statement of Banbury being famous for cheese, the words ' cakes and ale; and so it was passing through the press, when, Mr Camden coming in, and seeing the change, thinking 'ale' a somewhat disrespectful reference, substituted for it the word ' zeal, very unluckily, as it proved, for the Puritans, who abounded in the town, were greatly offended by the allusion, and so more was lost than gained by the change. Modern research has not failed to discover the early traces of the extreme Puritanism of Banbury. 'From the date of the execution of the Earl of Essex - the last and best-beloved favourite of the queen - an event which took place in 1601, the active mind of Elizabeth became seriously impaired, and the transaction of public business was disagreeable and irksome. The oppressed and consequently dissatisfied adherents of the church of Rome, taking advantage of this altered state of things, began to wax bolder in the expression of their opinions. Under the strict rule of the Puritans, the shows and pageants had been suppressed, and an attempt was now made by the Catholics to revive them. The dresses were procured, the characters rehearsed, and a day fixed for the performance in Banbury. 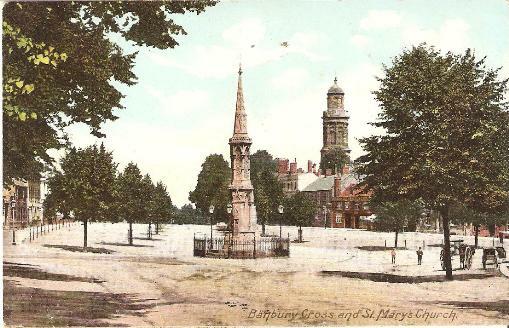 The procession of the performers had reached the high cross, and the actors were engaged in the prologue of the play, when a counter-demonstration issued from High Street, and a collision ensued between the excited partisans of the conflicting creeds. A regular melee is described as having taken place; but the supporters of the reformed doctrines, having both numbers and the law upon their side, seem eventually to have had the best of the fray. Having succeeded in driving their antagonists out of the town, the rage of the populace took a new direction. Hammers and pickaxes were procured, and the "goodly cross," the symbol of the faith of the Roman-Catholic world, was strewed in ruins through the Horse Fair. ... So thorough was the work of destruction, that a writer of the time compares the state in which the crosses were left - for there were at least four of them - to the stumps of trees when the trunks are cut down, or to the conveniences by a roadside inn, to aid a lazy horseman in mounting to the saddle. To the church the crowd repaired next, and worked their frantic will upon the stately temple. The magnificent windows of stained glass were shivered to atoms, as savouring too strongly of idolatry, and the statuary and sculpture mutilated and defaced by the hands of those insensible to forms of beauty. Corbet charges the rioters with not having left the leg or arm of an apostle, and says that the names of the churchwardens were the only inscriptions to be seen upon the walls. "To Banbury came I, O profane one! For Killing of a mouse on Sunday." In his long prayer, or in his fifteenth point"
And tumbled down the crosses. The organ, and the May-pole." That she may have music wherever she goes."